A Roman legionary was a professional soldier of the Roman army. 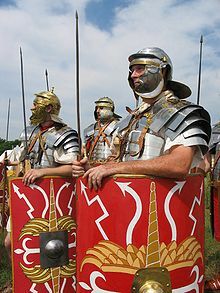 Legionaries had to be Roman citizens under the age of 45. They were members of a Roman legion. Legionaries went through very tough training. They had to do what they were told or they would be punished badly. Legionaries had to carry lots of heavy equipment when they were marching. Matyszak, Philip (2009). Legionary: The Roman Soldier's (Unofficial) Manual. Thames and Hudson. ISBN 9780500251515. This page was last changed on 28 September 2014, at 22:21.